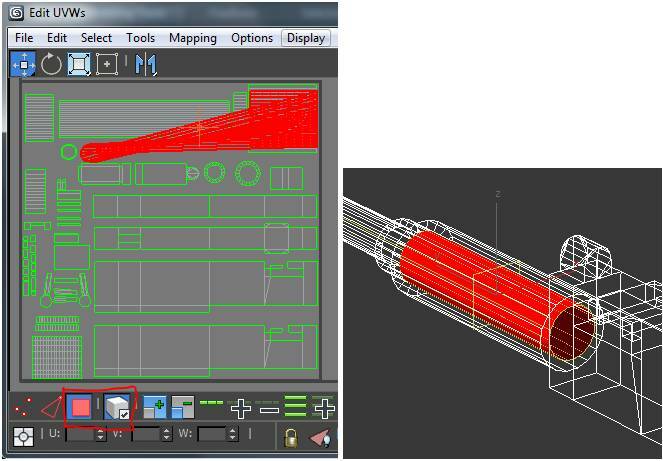 The basics of a Opacity map is to add transparency to parts of your model. 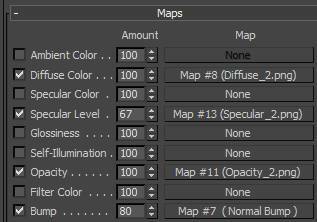 In a Opacity map there is just black, grey or white colors. The Black areas allow for full transparency, Grey allows semi transparency and White blocks any transparency. For the 50 Cal gun we need full transparency for the holes in the first gun segment. Go back to your 3ds Max Project. Collapse the Unwrap modifier. 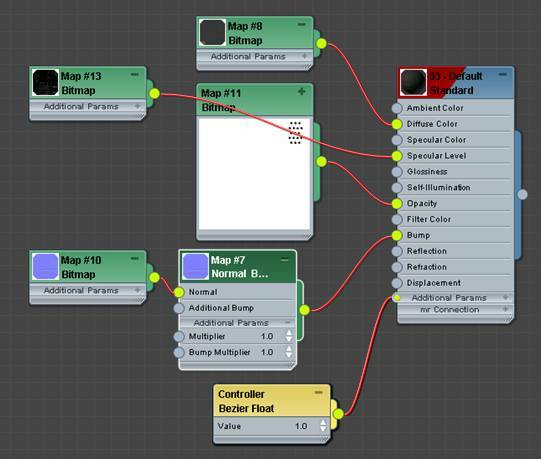 Uncheck all the Maps.This makes it easier to make an edit to the model. In Polygon mode, group select everything except the barrel. Click Hide Selected, under Edit Geometry. 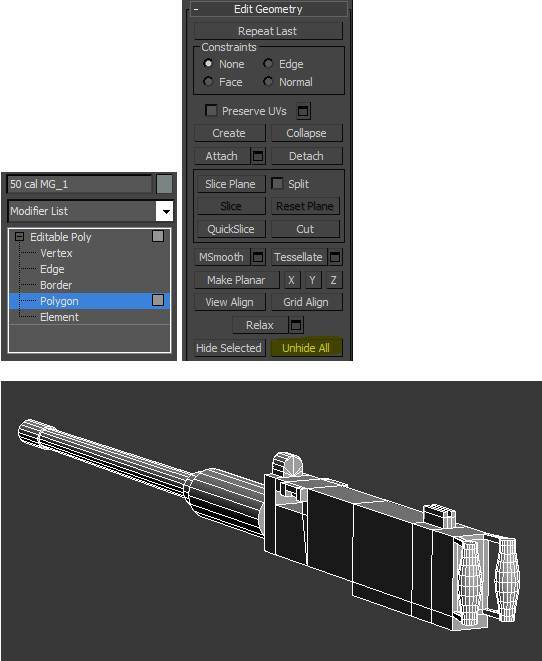 Click the rear poly and delete it so we can get inside the barrel. 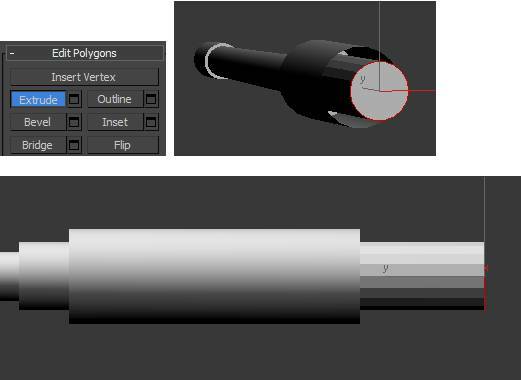 Click the second barrel segment inside poly and click the Flip button under Edit Polygons. 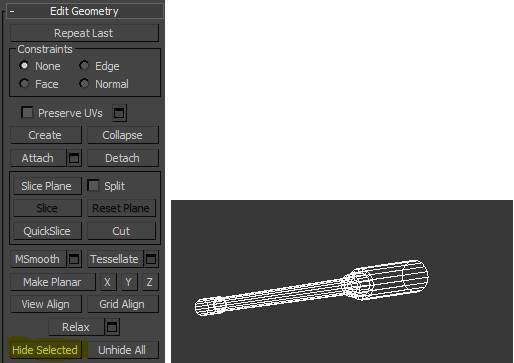 Go to Extrude and pull the extrusion a bit outside the barrel. We have to Smooth the inner barrel poly’s. Group select the inner barrel poly’s. Put them in an emptySmoothing Group. Now the inner barrel is smooth. 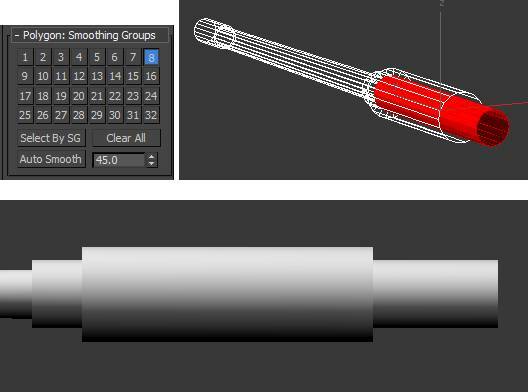 Use the Move tool on the X Axis to line up the inner barrel with the outer barrel. Delete the end of the inner barrel. Go to Border mode and click the border of the outside barrel. 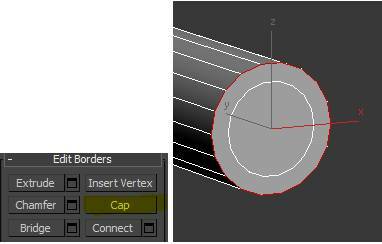 Go to Cap under Edit Borders to fill with a polygon. Go back to Polygon mode, Then Unhide All. Now the whole gun objectis visible again. 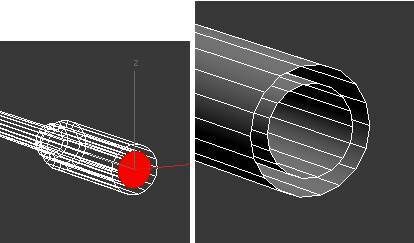 The inside barrel will only be seen when the opacity map is applied. 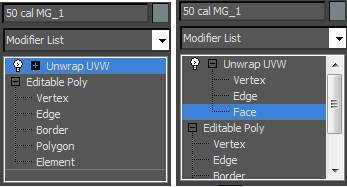 Add an Unwrap UVW modifier to the stack again. Go to Face mode. 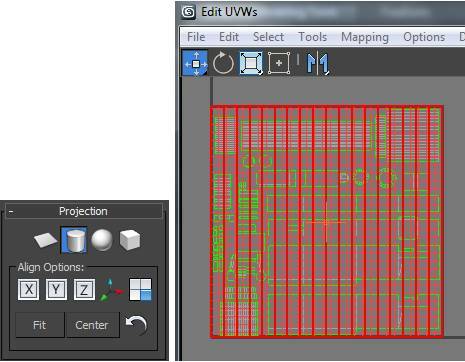 Open the UV editor window. 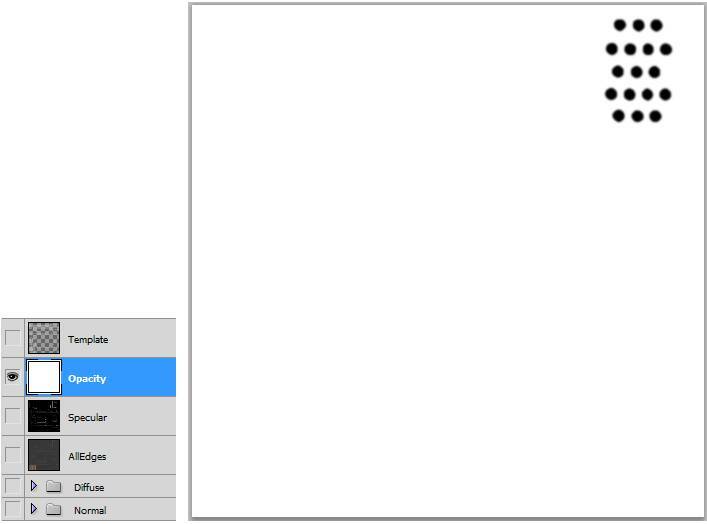 Click the Polygon button and the Select by Element buttons. 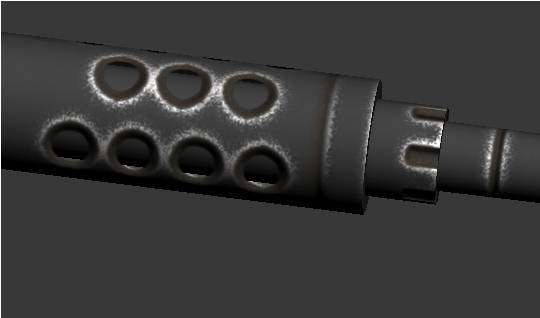 Click the new inner barrel mesh. 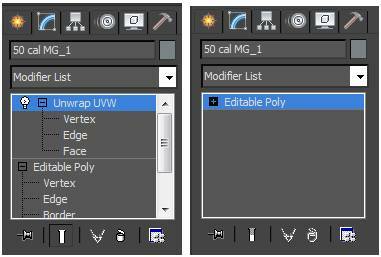 In the Edit UVWs menu, go to Tools/Break. 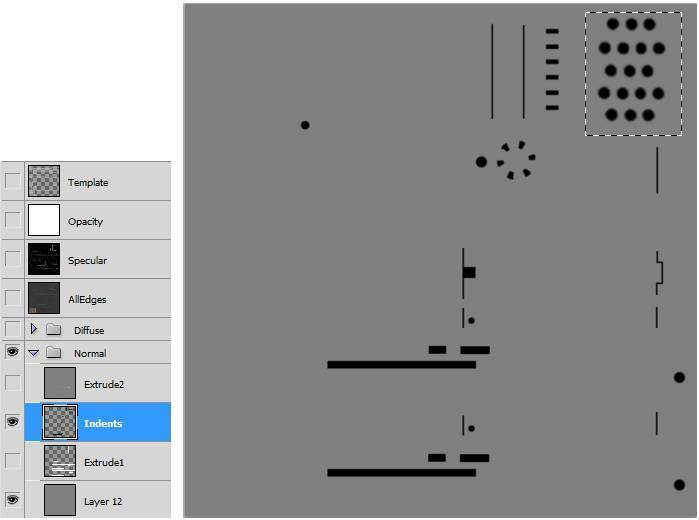 Under Projection, click the Cylinder button. Unclick the Cylinder button. Scale down the mesh. 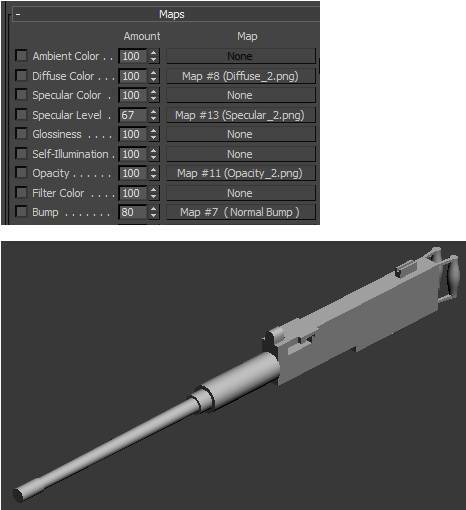 Place it in the middle of the third barrel segment, where there is empty space on the Diffuse map. It’s ok to overlap here. In an Opacity map there is just black or white colors. For the 50 Cal gun we need transparency for the holes in the first gun segment. 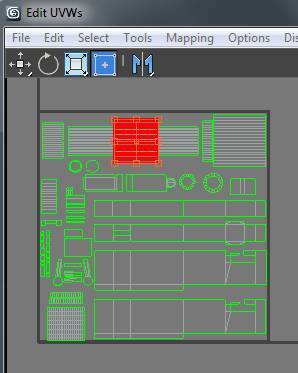 In 3ds Max, you can setup the Opacity map with nodes, if your version of 3ds Max has the Slate Material Editor. Open your latest 50 Cal psd. 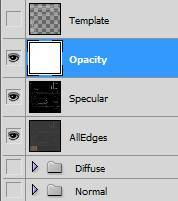 Create a new layer called Opacity. Fill it with white. 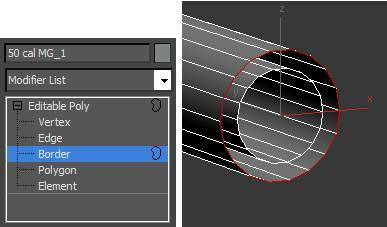 Go to the Indents layer inside the Normal group. 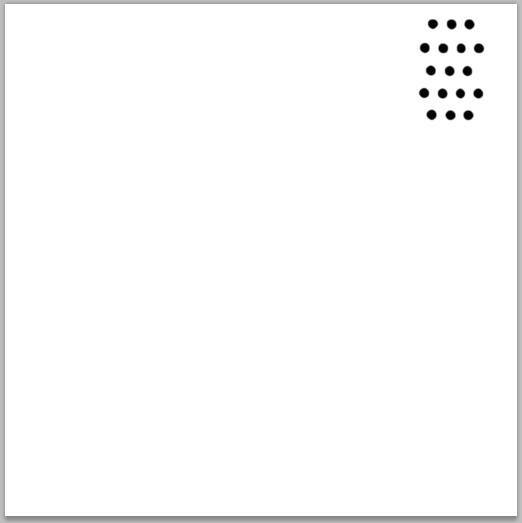 Make a square selection over the 17 black spots. Go to Edit/Copy. Go back to the Opacity layer. Then to Edit/Paste Special/Paste in Place. Merge down the pasted layer into the Opacity layer. Zoom in to the 17 spots. 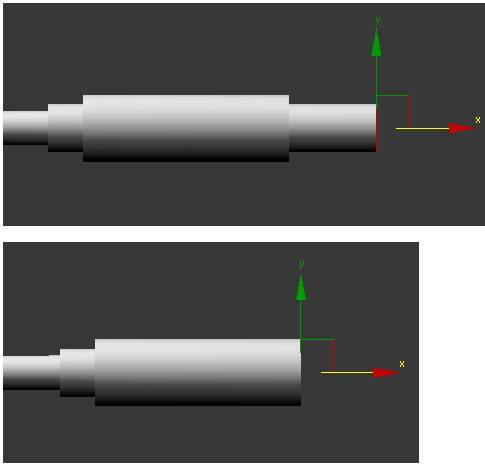 Use the MagicWand with Tolerance of 26, uncheck Contiguous. Click in the middle of one of the spots. 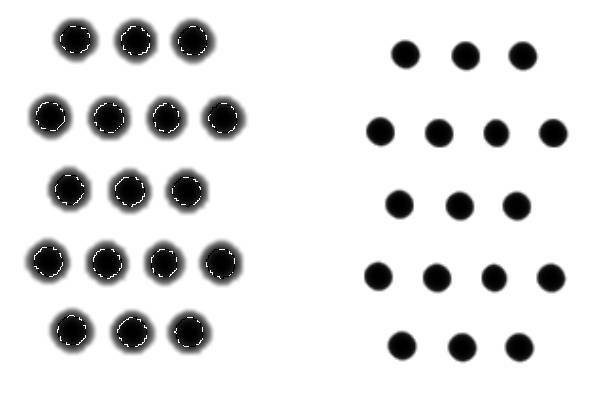 The black center of the spots are selected. Then go to Select/Inverse, and then Edit/Fill, with a white color. Then Filter/Blur/Blur more. The black spots are now where we want transparent holes. This will be the Opacity map. 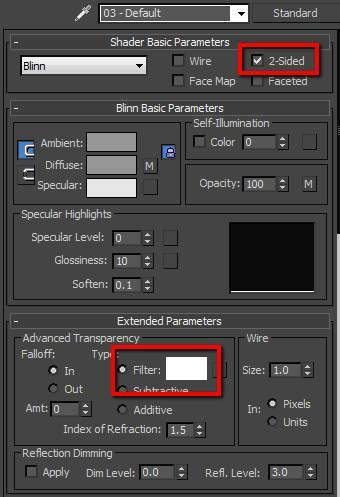 Go to 3ds Max and make sure 2-Sided is checked, and Filter is white.